Share the post "Borage – An Easy Growing Edible Herb With Medicinal Properties"
Borago officinalis or simply Borage is an easy growing annual herb, native to the Mediterranean region, which has been naturalized in many countries. It grows well in gardens in the UK climate, growing from year to year by self-seeding. Its flowering season is relatively long, from June to September. In milder climates, borage will bloom continuously for most of the year. The leaves have a flavor of cucumbers and are edible, delicate flowers are edible as well, so the plant is grown in gardens for that purpose in some parts of Europe. Borago officinalis is also commercially cultivated for borage seed oil extracted from its seeds. The oil is often marketed as “starflower oil” or “borage oil”. Vivid star shaped blue flowers, perfect with five narrow, triangular-pointed petals, are quite the contrast next to the plant’s big hairy leaves. Pink and white flowered types are also cultivated. Borage flowers are rich in a sweet nectar, so bees love this plant. Borage is a good companion with many plants. It is said to protect or nurse legumes, spinach, brassicas, squash, courgettes and even strawberries. Borage is said to increase flavor of strawberries. It is also said to be a good companion plant to tomatoes because it confuses the mother moths of tomato hornworms or manduca looking for a place to lay their eggs. It might also improve tomato growth and make them taste better. Borage is the traditional flower of courage and imparts cheerfulness. Ladies would embroider silk handkerchiefs with borage flowers as ‘favours’ for jousters and soldiers who would collect them as they were dropped. Borage for Courage is an old saying which appears to have some truth as a chemical present acts on the adrenal gland. Borage is a domestic herbal remedy that has been used since ancient times. It’s been traditionally used to make a tea (leaves and flowers) to rid the body of a fever. But also has been said to promote lactation, possessing anti-inflammatory properties, and helping relieve cold symptoms. It was also used to treat lung problems, chest disorders, cleanse blood, make a good gargle for sore throats and mouth ulcers as well as being good for sore eyes when made into a tea/lotion. Some people use borage as a substitute for valerian as it dispels melancholy and induces euphoria. 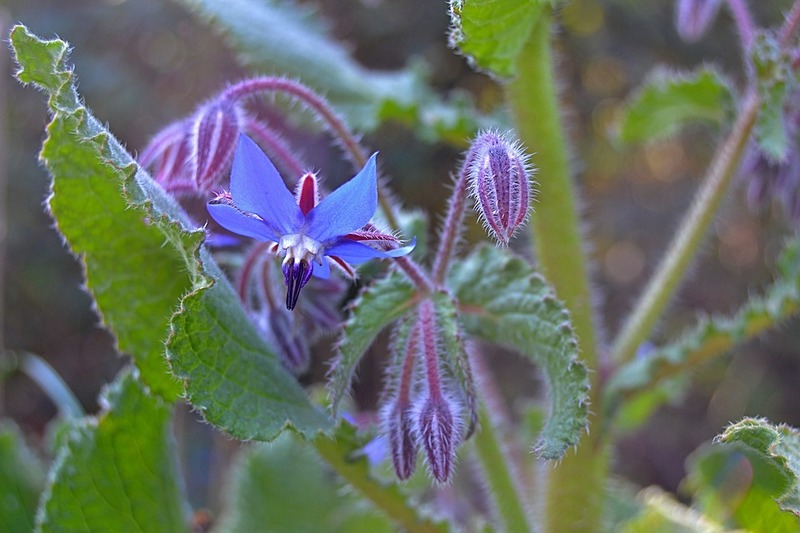 Read more about medicinal and culinary uses of Borage herb further in this article. Hardiness: USDA Hardiness Zones do not apply, but we found in some sources – USDA hardiness zone 6 – 9, hardy to zone (UK) 7 and is not frost tender. Soil: Sand, Loam, Clay, Chalk. Acid, Neutral, Alkaline. Well-Drained. Can grow in nutritionally poor soil, but the richer the soil, the more spiky the plant is. Time to plant: Fall. In warmer regions, plant the seeds in October so the plants bloom in the cool months. This will produce larger plants and earlier flowering. In areas with cold weather, the seeds can be planted in the spring. Propagation: From seed; direct sow outdoors. The plants quickly develop a stout tap-root and do not transplant successfully. The plant usually self-sows prolifically. Culinary uses: Borage is used as either a fresh vegetable, a pot-herb or a dried herb. The leaves may be picked at any time and used fresh. As a fresh vegetable, borage, with a cucumber-like taste, is often used in salads or as a garnish. Very hairy, the whole leaves have an unpleasant feeling in the mouth and so they are best chopped up finely and added to other leaves when eaten in a salad. Leaves can be also added whole as a flavoring to various drinks such as Pimms and wine-based drinks. The flower (raw) has a sweet honey-like taste and is often used to decorate salads, desserts, summer fruit drinks and cocktails. Vegetable use of borage is common in Germany, Spain, Greece and in the northern Italian region of Liguria. Although often used in soups, one of the better known German borage recipes is the Green Sauce made in Frankfurt. In Italian Liguria, borage is commonly used as a filling of the traditional pasta ravioli and pansoti. It is used to flavour pickled gherkins in Poland. The leaves are rich in potassium and calcium. A refreshing tea is made from the leaves and/or the flowers. Some people chop and dry the leaves and store them dry. The dried stems are also used for flavoring beverages. But it is better to use fresh leaves as dried leaves have little of the characteristic flavor so the plant is best consumed after harvest. An edible blue dye can be obtained from the flowers. It is used to color vinegar, however it turns pink on contact with acids. Medicinal uses: Borago officinalis is a common domestic herbal remedy that has been used since ancient times. Traditionally, the herb has been used in hyperactive gastrointestinal, respiratory and cardiovascular disorders, such as gastrointestinal (colic, cramps, diarrhea), airways (asthma, bronchitis), cardiovascular, (cardiotonic, antihypertensive and blood purifier), urinary (diuretic and kidney/bladder disorders). 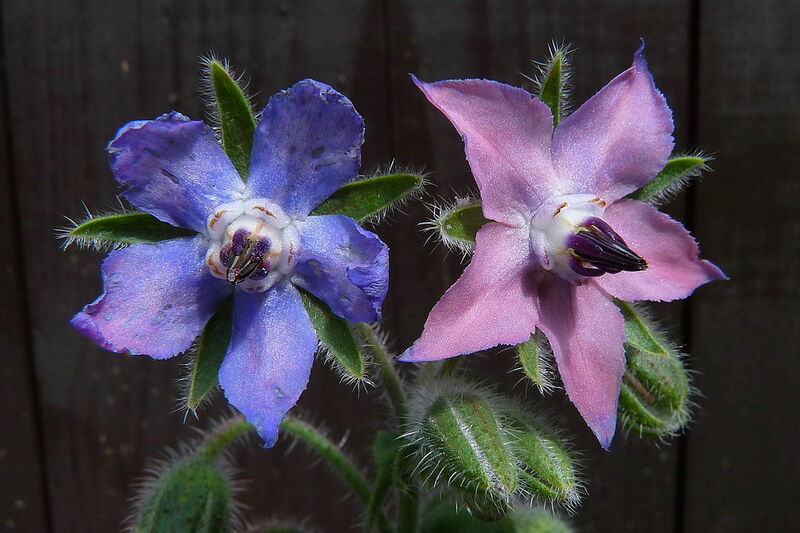 Borage has a good reputation for its beneficial affect on the mind, being used to dispel melancholy and induce euphoria. Naturopathic practitioners use borage for regulation of metabolism and the hormonal system, and consider it to be a good remedy for PMS and menopause symptoms such as the hot flash. The seeds are a rich source of gamma-linolenic acid, this oil not only helps to regulate the hormonal system but also lowers blood pressure. It is used both internally and externally, helping to relieve skin complaints and pre-menstrual tension. Used for the treatment of phlebitis (inflammation of the veins). Externally it is used as a poultice for inflammatory swellings. It is said to be great for bath infusions, as it is anti-inflammatory and relaxing in the tub. An infusion or tea made from leaves and flowers is taken internally to treat fevers, help to relieve cold symptoms, chest and kidney problems, though it should not be prescribed to people with liver problems. Other uses: The growing plant is said to repel insects. Fertilizer: any fertilizer labeled for use on edible plants. Something with a high phosphorous number (the middle number on a fertilizer package) will help keep them in flower. Has Thorns: Older leaves get prickly. Edible: Yes – flowers and leaves. The black parts of the flowers need to be removed. Toxicity: The leaves contain small amounts of pyrrolizidine alkaloids that can cause liver damage and liver cancer. These alkaloids are present in too small a quantity to be harmful unless you make borage a major part of your diet, though people with liver problems would be wise to avoid using the leaves or flowers of this plant. The German Federal Institute for Risk Assessment has advised that honey from borage contains PAs, transferred to the honey through pollen collected at borage plants, and advise that commercial honey production could select for raw honey with limited PA content to prevent contamination. PAs are also present in borage seed oil, but may be removed by processing. • Borage prefers a sunny location with rich, well draining soil. • After seedlings are up and prospering, keep the soil on the dry side because over-watering will kill the plants. • This plant does not transplant well because of its deep taproot. • May be affected by powdery mildews. • May be damaged by slugs and leaf-mining flies. • Pinching the terminal growth will force a bushier plant but may sacrifice some of the flowers. Do you grow Borago officinalis (Borage) in your garden? What is your experience with this plant? Please share with other fellow gardeners in the comments below! Do you sell Borago officinalis (Borage) seeds for sale? You can place your advertisement here. Contact us now!